Individual friction wheel-driven bogies transport the bodies through the body shop, paint shop or final assembly. Horizontal and vertical bends are possible. Equipped optionally with a flexible lift suspension fixture, it is possible to cross production lines and transport routes and to lower the body to any working level. 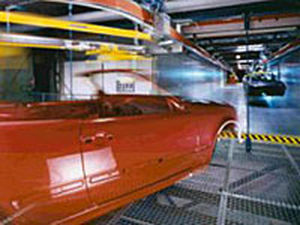 Lifting stations for vehicle bodies are used to convey the body to other levels. Features: Quiet and clean; high speeds are implemented. Available optionally with FASmotion technology.